What is Wrong with Harry and Mary? Once upon a time: A guy named Harry and his girlfriend Mary had an argument. Mary started winning, so Harry punched her in the face! 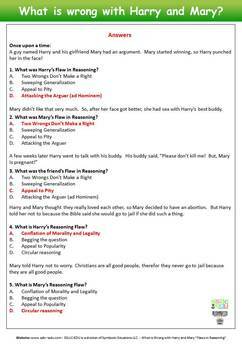 What was Harry’s Flaw in Reasoning? What is wrong with Harry and Mary? 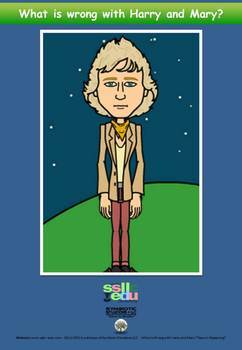 is an edgy, fun and interactive way to introduce the world of Informal Fallacies in logic. We start the story...your students continue and finish the story. File is PPT so you can make any necessary adjustments or extensions. OBJECTIVE: 1. Introduce students to the concepts of Informal Fallacies/Flaws in Reasoning and how they affect everyday decision making. 2. Motivate the students to learn more about Logic. 8. Review the main points of the lesson and dismiss the class. 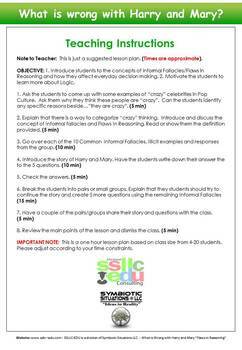 IMPORTANT NOTE: This is a one hour lesson plan based on class size from 4-20 students. Please adjust according to your time constraints.